Gigabyte Intros Overclocked Variant of GTS 450 named WindForce Extreme. 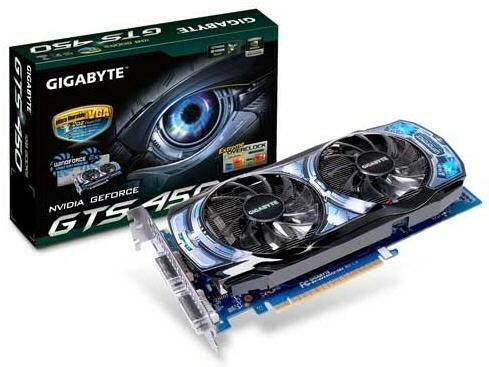 Gigabyte has introduced its new Overclocked Variant of the GTS 450 which is called the WindForce Extreme Overclock edition graphics card, It is obvious from the name that the card will have higher clocks than the stock variant but also features a Non-Reference PCB and Cooler. The model number of the card is GV-N450OC2-1GI and features the following clocks of 930 MHz Core clock(vs. 783 MHz reference), 1860 MHz CUDA cores (vs. 1566 MHz), and 1000 MHz or 4.00 GHz GDDR5 effective (vs. 900 MHz/3.60 GHz) memory. The PCB is also custom designed by Gigabyte and is a bit longer than the reference one and makes use of Gigabyte’s Ultra Durable VGA construction. The Windforce name comes from the unique dual fan cooler on top of the GPU which provides much better cooling than the reference design. The card is priced at US $149.99 and is available at shops all around the globe.